First, double click the icon of PDF to PowerPoint Converter to run this application. If this is the first time for you to use this application, a dialog box will pop out. Please click OK, and then the interface as follows will appear on the desktop. The second step is to add PDF files. You can drag the files you want to print, and drop them to the list box under PDF Files. Or you can click the button Add PDF File(s), select files in the dialog box that pops out and press Open in that dialog box. All the added files will be listed in the list box, where you can view the input paths as well as the file sizes. The third step is to set options. You can set options to preserve all the original layouts, text, hyperlinks and images in the output PPTX files, set page range and input PDF passwords. There are four groups on the right side of the list box. If you want to generate text-only PPTX files from a PDF files, you can click the second radio button in the first group Output Options. If you want to restrict the layouts in the output files, you can click buttons in the second group named Reconstruction Mode. If you want to set page range, you can click the second button before Select Range under Page Range, and then select values in the From spin box and To spin box. If your PDF file is protected by an owner password or an open password, please type the password in the PDF Password edit box. After setting the options, please click the Convert button. The computer will instantly begin to generate PPTX from PDF. 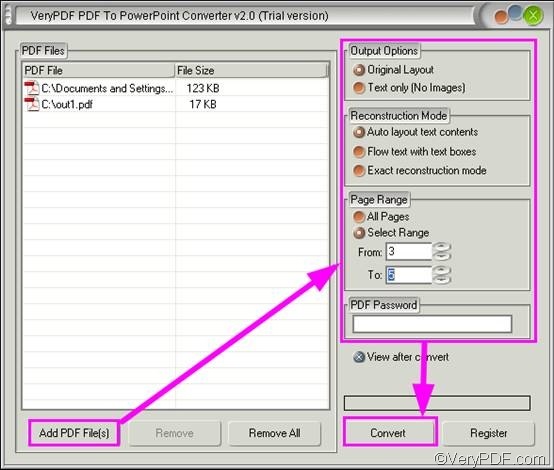 How to convert pdf to pptx? This entry was posted in PDF to PowerPoint and tagged pdf to pptx. Bookmark the permalink.